If I recall correctly, pawpaws are the biggest fruits that are native to the new world. They have not been improved all that much with any consideration for mass market. The skin is very thin and easily torn or bruised. The seeds are huge and do not come out easily. 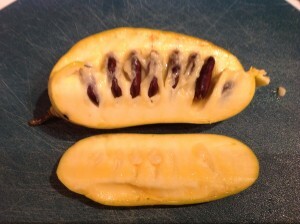 The flesh of the ripe fruit is slightly mushy and has the texture of a ripe banana. Ripe pawpaws often have black spots on them, like an overripe banana or apricot, that imply something might be wrong with them. Hence, not appealing in any way to the mass market. The taste is reminiscent of banana custard. 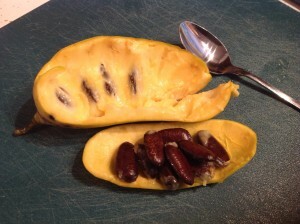 There is sweetness and a little bit of tang, and happily I can say that the fruit tastes like it smells. There are no lies when you bite into it. 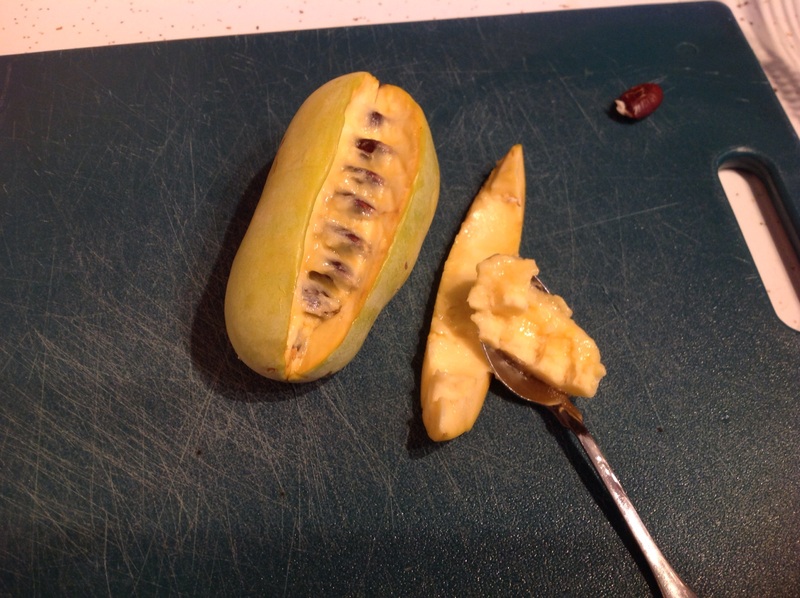 There are a bunch of varieties of pawpaws, of which we appear to have two in our yard. (We have two trees producing small peanut-shaped fruit about the size of two golfballs and a stand of trees that produces fruit the size of a fat Idaho potato.) Pawpaw trees are easy keepers, but prefer a lot more water than they usually get here on the top of the hill if they are actually going to produce fruit. 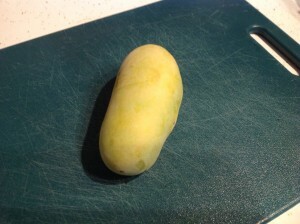 This year we had a lot of rain over the spring and early summer, and the results were delicious. Boo, I have no access to your photos. 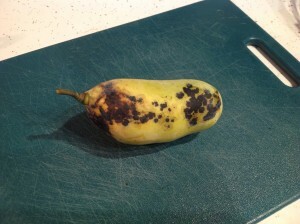 I wanted to see Death & Destruction in the Pawpaw Patch. I have no idea how those images ended up locked. Thanks for letting me know! Hopefully you can see them now. 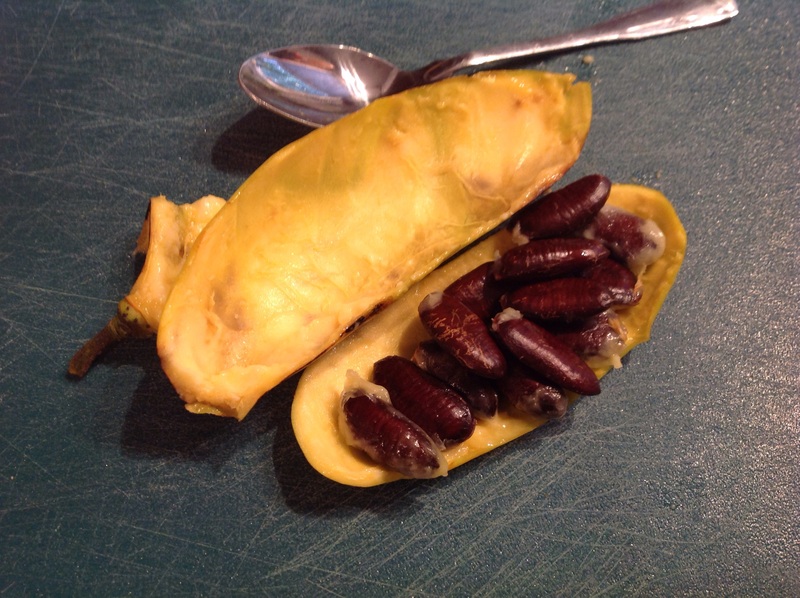 Wow, the seeds look like big fat kidney beans.